All the FUN and none of the mess! 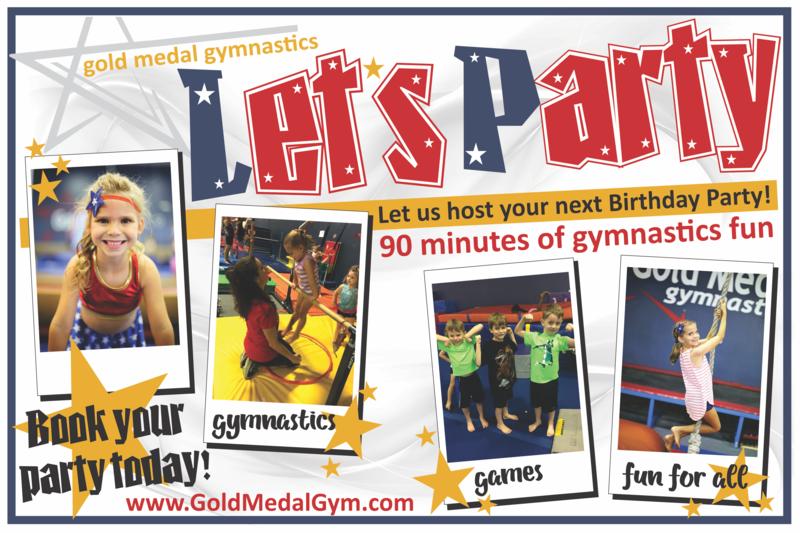 Let us set up the party, play games and teach fun gymnastics and you take the pictures! These kid only events are a great way to celebrate your child’s next birthday. Parents are welcome to stay during the party in our parent viewing area. Parties are 90 minutes in length and included gymnastics fun and party time in our private party room. Gold Medal Gymnastics provides gymnastics instruction & games, instructors and party hosts, invitations, tables, party supplies such as plates, napkins, silverware, balloons bouquets plus all the clean-up. Party guests receive a “Gold Medal” at the end of the party! Our parties are bound to bring smiles to your child and all their friends. Call either of our locations to verify party availability. RSVP Early! Call to verify availability. Tempe: (480) 557-0006 or Chandler (480) 857-7335. All you have to do is invite your guests, plan your date, and bring the snacks, food and beverages of your choice. Set-up begins 15 minutes prior to your party. You are welcome to decorate our party room in a theme of your choice too! Let our party planners help you make this a memorable event for your child. Prices vary by number of participants. RSVP number of anticipated guests the week prior to your party. This will help us staff your party for the best experience and safety of all participants. Your party cost will be based upon the number you RSVP plus any additional guests that show up on party day. Each additional guest: $ 10.00 each. Keep the party going - ask about details if you are interested in extending the play time for your party guests!